Out of Fresno, it takes three flights to get to the UK. Heck, out of Fresno, it takes three flights to get to most places, but that’s another story. 🙂 Marilyn and I took a 6am flight out of Fresno and went through LAX, Washington DC/Dulles, and finally to Manchester, UK. Marilyn wasn’t amused about a 3am wake-up time for a 6am flight, but there are really no other good options and it’s always a better idea to get an early start when leaving Fresno. We easily made all connections, and even met up with my husband at LAX and chatted for a bit, so that was fun. The cross-Atlantic flight is not bad – just under 7 hours – though neither of us got much sleep. Once at the hotel, we were fortunate to have our room ready at 8am (yay! ), unload our things, freshen up, and head out to find food and walk off the flights. I had English fish & chips at The Lobster Pot for lunch, a huge serving that I could not attempt to finish. After some time to email (me) and nap (Marilyn) in the room mid-afternoon, we headed out again just as an attempt to stay awake to help transition to UK time. We had dinner at Ed’s, a UK franchise with delicious burgers and shakes. Not that we tried a shake (we didn’t, though I did drool a little in watching others’ ice cream creations), I mean, but they’re famous for them, so they must be good! We got a decent night’s sleep, Marilyn more than me, but enough to move on for the day. Marilyn arranged ahead of time to have a massage at Lush spas and had a wonderful time! I can never relax and enjoy a massage (I know, I’m a loser) so I did some window shopping and caught up on a little work in the hotel. More shopping and a late lunch at The Lobster Pot [again] where I had chicken curry over chips and Marilyn had chicken kebab. The tour guide, Tony, arrived this morning, after his original flight was cancelled on Sunday. We’ll work together on some logistics in order to be ready to lead a group of 22 Beatles Fans on their 7 day Pilgrimage tour. It’s going to be a fantastic time! Dinner at Brown’s is delicious (seafood linguine) but isn’t complete without Sticky Toffee Pudding with ginger ice cream and caramel sauce. I fell in love with this last year and pretty sure it might have been even better this year. In some countries, food this good is surely illegal. Sigh. Time for bed. Hopefully we both wake up tomorrow feeling rested and fully adjusted to the current time! Sounds great! Can you bring home some of that toffee pudding dessert thingy please?? Oh, I need to try that toffee pudding next time!!! I hope your internal clock adjusts soon! 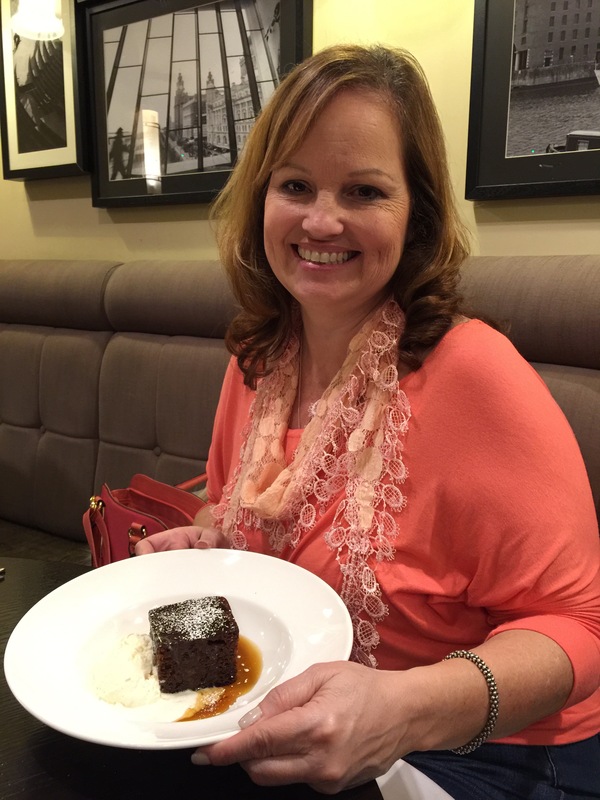 Toffee pudding… sounds good but I put on 5 lbs in 2 weeks in Maui!!! Boo!